The Ever-Shrinking PC: Could Windows Mobile be “Netbook 2.0”? The answer may be closer than we think. Microsoft recently applied for a patent on a “smart interface system” that allows you to dock your smartphone and use it as a PC. Once docked, your smartphone would have access to peripherals such as a monitor, keyboard, mouse, Ethernet connection, USB hub, and printer. A smartphone as a computer? Some may scoff at using a device that still struggles to make a basic phone call as a central CPU, but the truth is that we’re not that far away. Phone processors today rival those of computers from only a few years ago. With processing speed continuously getting faster, the price of storage becoming cheaper, and cloud computing becoming more prevalent, it’s not so crazy a notion that our mobile devices will be the personal computers of the future and our connection to full-blown PC applications, our friends, and the online world. The applications for a smart interface system range from a mobile computing device for office professionals, to a portable entertainment system for consumers, to distance learning devices for children in developing countries. The system could even feature a smart interface to determine what profile to use based on the configuration of the peripherals attached. 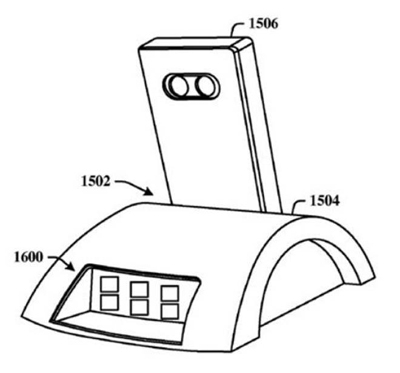 Says the patent: “By detecting one or more of the externals systems the smart system can automatically select the user profile to employ.” For example, if a mouse and projector are set up, the profile could be set to work presentation mode. If a TV and surround sound system are plugged in, the profile would switch to home entertainment mode. Below is a diagram of how such a system might look. Welcome to the future of mobile computing.